The rich color palette, historical-chic venue, and modern fashion choices in this Australian wedding at The Kittyhawk have us ready for all the moody, autumnal weddings! Deborah and Adrian are anything but traditional and they crafted their wedding to feel the same way. Their day was broken into two parts. First, they had a civil ceremony, which they wrote themselves, followed by a tea ceremony and lunch for just their family and closest friends. Then they surprised an additional group of guests with an “engagement party” style reception complete with the most delicious-looking dessert table we’ve seen! We love how Deborah and Adrian made their entire day feel soulful and dark by putting extra emphasis on moody florals and textural attire. Their unique vibe came across beautifully in these photos captured by Fox & Kin, whose moody photography style matched the feel of the entire day. On top of a colour palette, I’m very much about a texture palette – my gown was a heavy drill silk with a removable delicate lace top, the groom wore a velvet jacket with a jacquard bow tie, the bridesmaids had tapestry/brocade dresses, and the groomsmen had bow ties of the same tapestry/brocade. We did away with or modernized a lot of traditional wedding customs in both our civil ceremony and the tea ceremony. We danced down the aisle together to Glen Miller’s “In the Mood” because we don’t believe in ceremonial exchanges of chattel and wanted to come together of our own free will and choice to marry each other (read: becoming a single economic unit). I deliberately forewent a veil because of its deeply misogynistic history. And, instead of young flower girls representing fertility, I had my grandmother and her great grand-daughter serve as flower girls to represent 4 generations of girl power. Oh, and I had pockets in my wedding gown and bridesmaids’ dresses because women deserve functional pockets, too! There was a page of our program dedicated to explaining our non-traditional choices, and we also customized the entire celebrant’s script to make sure it was true to our values. The venue, with its gilded mirror frames, rich wallpaper and dark wood exuded that dark, romantic, cozy vibe we were after. We chose this vibe because it represents how we like to spend time together and it felt very us. We love a good historical culture fix, and we never want to stop learning and experiencing the world. There’s always something jazzy playing in the background when we’re quietly working in each other’s presence. We chose everything together, from the wedding gown to the groom’s socks. 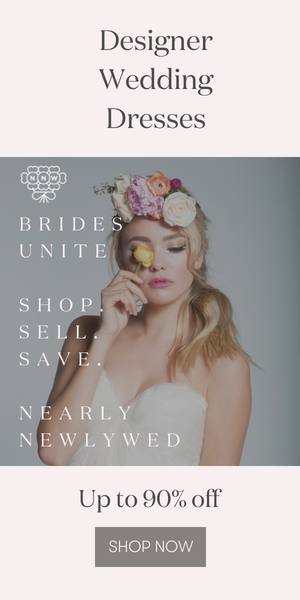 Hair Styling – The Future Mrs.
Groom’s Apparel – Tailor & Co. Rings – Linda & Co.
Congratulations to Deborah and Adrian, and a big thanks to Fox & Kin for sharing this Australia wedding at The Kittyhawk with Junebug! Looking for more dreamy autumn wedding inspiration? This Evergreen PDX wedding has the prettiest autumnal floral details!